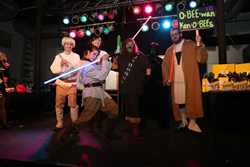 Orchard Place, mental health experts for Iowa’s children raised nearly $75,000 at its 12th annual Spelling Bee, presented by Nationwide and held at Wooly’s on March 5th. This event has raised more than $895,000 in 12 years. Funds raised go directly to support summer programming for Iowa children with mental health issues served by Orchard Place. “Community support has clearly made this one of the most successful fundraisers in Central Iowa,” said Orchard Place Director of Development Nancy Bobo. “We are so grateful for our corporate sponsors, the 15 teams who took part, and the fundraising efforts that team members completed to make this event a success. The Orchard Place Spelling Bee is a one of a kind event where contestants literally pay for mistakes, bribe judges, and can win without spelling one word correct (if they have sufficient bribery funds to pay off the judges.) The fun was enhanced by prizes and appetizers donated by 38 Des Moines Businesses. Grand Champion Spellers – O-BEE-Wan KenoBEEs – A Nationwide team who won the event after several fierce rounds of competition with the CGC team by spelling the word ‘epexegesis’. The force was clearly with them. Best Costumes – The BEE-Railed Corporate Office Double-Loop, Corkscrew, Flying Zero-Gravity Coaster – Orchard Place’s Corporate Office team rode their unique roller coaster all the way to victory in the costume competition. Most Bribe Money Raised by a Team – Team BEElieve, Orchard Place Child Guidance Center’s bribe-happy money-laden team raised more than $12,000 in bribery funds, taking home this coveted award this year. Best Team Name – BEEva Las Vegas - This is a second-year win in this award competition for the Stelter Company team. They BEE leaving in Vegas what happened in Vegas. Best Cheering Section – The ReferBEEs – A rowdy Nationwide team that coasted to victory in this competition with their cheering prowess again this year. Hosted by ‘Queen Bee’ Wicker VanOrsdel, the event again topped expectations of producing a zany take on serious spelling bees of the past.